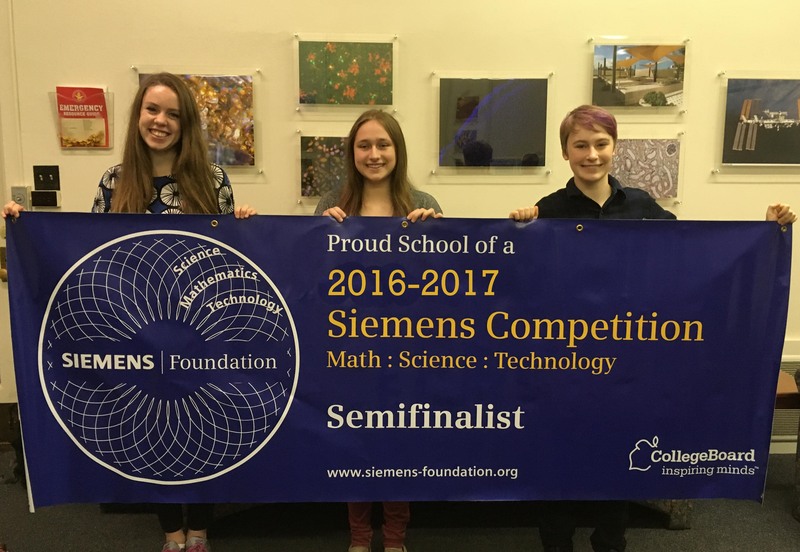 Hathaway Brown School is proud to announce today that three of its seniors have been named semifinalists and one of the three named a regional finalist in the 2016 Siemens Competition in Math, Science and Technology for their multiyear original research projects through the Science Research & Engineering Program (SREP). Hathaway Brown is the only school in the state of Ohio with more than one semifinalist in this year's competition. Congratulations to (L-R) Margaret Broihier, Gigi Protasiewicz, and Zoë Solt. Solt has also been named a 2016 Siemens Regional Finalist out of 30 individuals and 30 teams in the United States. In November, she will compete for one of six of the national finalists slots. Broihier has worked three summers on her research in the Case Western School of Medicine in the Department of Neurosciences with Dr. Gary Landreth and graduate student, Taylor Jay. The work she submitted to Siemens is on the topic of The Role of TREM2 in Alzheimer's disease (AD). She reports that there are fewer immune cells in the brain of AD mouse models due to both a decrease in proliferation (new cells) and an increase in cell death. Protasiewicz has spent three summers in the Biomedical Engineering laboratory of Dr. Jeff Capadona working with John Hermann at Case Western Reserve University on the project "Evaluating the Presence of Toll-like Receptors at the Intracortical Microelectrode Interface." When an electrode is implanted into the brain for a purpose such as functional improvement after paralysis, it eventually leads to neuroinflammation of the brain and microelectrode failure. Gigi has studied particular neuroinflammatory markers and changes in their expression to improve the longevity of the electrode. Solt has worked with Dr. Jesse Berezovsky and Robert Badea in the Department of Physics at Case Western Reserve University for 2.5 years for her project on "Domain Wall Motion in Concave Ferromagnetic Nanowires." She studied various nanowire geometries to identify the best structure to facilitate spin-based electronics starting with computer simulations and progressing to actual fabrication of concave permalloy nanowires. Launched by the Siemens Foundation in 1999, the Siemens competition is the nation’s premier competition in math, science and technology, promoting excellence in math, science and technology. For more information on the Siemens competition, click here. Congratulations Margaret, Gigi, and Zoë!